My blog drought is well and truly over. A triple-header is a sure sign of an information downpour. If you’re astute (and let’s face it, the world needs more stutes), you would have noticed that I’m not teaching at Tamworth as advertised for this weekend. The hosts have put the dates back until later in the year. So tonight I will head to Govinda’s for a night of bhajan and kirtan. And tomorrow after a long day’s fasting, I will celebrate the Appearance day Festival of Lord Nrsimhadeva, the fierce but loving half-lion avatar of Krishna. Since this evening’s chanting will conclude in a feast upstairs in Govinda’s dining area, I decided to cook a late/breakfast/brunch to keep me going until then. And yes, It looked so nice that I decided to whip out my camera. 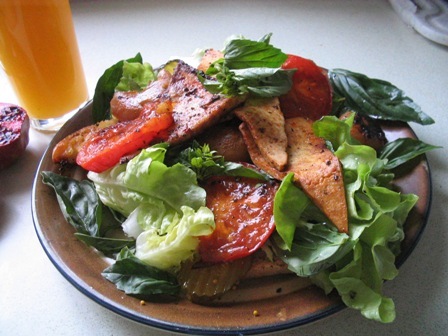 Alongside the ultra ruby-red pomegranate and freshly crushed pineapple and mandarin juice is: pan-fried tofu, fried trellis tomatoes, smashed potatoes roasted in herbed olive oil, with butter-leaf lettuce, fresh basil & pickled cucumbers on homemade sourdough toast.